The energy park includes a 100MW solar PV project and 150MW wind farm. Image courtesy of Canadian Solar. The project, which has a value of approximately $7bn, consists of a 150MW wind farm and a 100MW photovoltaic (PV) solar farm. It received approval from the Canadian Ministry of Environment in June 2012. Construction began in November 2013 and was completed in January 2015. The solar project started in October 2013 and is scheduled for completion in 2015. The solar farm is expected to be the largest solar photovoltaic project in Canada, surpassing the 97MW Sarnia power plant. "The project, which has a value of approximately $7bn, consists of a 150MW wind farm and a 100MW photovoltaic (PV) solar farm." GREP is being developed in response to the Government of Ontario’s initiative to promote the development of renewable power in the region. It will be located on privately owned and Ontario Realty Corporation (ORC)-managed lands. 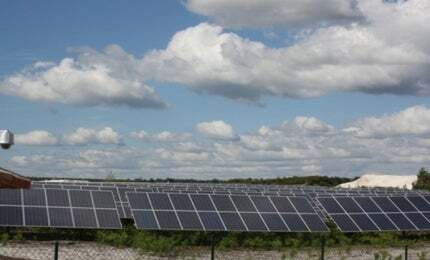 The 100MW solar project will be located in the Haldimand county, and is owned by Samsung C&T, Conner Clark & Lunn Infrastructure, and Six Nations. Classified as a class 3 facility, the solar project will include approximately 440,000 Canadian Solar CS6X high-performance PV modules. The panels will be formed into units of 1MW each and installed on fixed ground-mounted racking structures. The PV plant will produce approximately 165,000MWh of electricity a year, which will be sufficient to power 13,750 Canadian homes. It is expected to offset approximately 162,000t of carbon dioxide emissions annually. The 150MW Grand Renewable Wind (GRW) project, owned by Samsung Renewable Energy, Pattern Grand, and Six Nations, is located on privately held land throughout South Cayuga. Classified as a class 4 facility, the wind project consists of 67 Siemens SWT-2.3 wind turbines, 65 of which have a capacity of 2.22MW each and two of 2.12MW. It will provide clean energy for approximately 50,000 homes in Ontario each year. Each Siemens SWT-2.3 wind turbine has a rotor diameter of 101m and a swept area of 8,000m². The tower has a hub height of 100m and a tip height of 149m. Turbine towers were manufactured at the CS Wind facility in Windsor and Siemens manufactured the turbine blades at its Tillsonburg facility. The wind farm has created more than 500 construction jobs and 12 full-time permanent operations and maintenance positions. Electricity produced by the wind farm will be delivered to Ontario’s Independent Electricity System Operator under a 20-year power purchase agreement. The Cornwall Ontario River Energy project is being developed in the St. Lawrence River in Ontario, Canada. The power generated by the two projects will be collected at a collector substation located near Haldimand Road 20 and Mt. Olivet Road. It will then be transmitted to the Ontario electricity grid through a 20km-long, 230kV overhead transmission line. All power from each PV panel row will be collected by a wiring system and transferred to one of two 500kW DC to AC power inverter panels at each of the 100 solar units. The AC output from the inverter panels will be delivered to an adjacent 1MW solar step-up pad-mounted transformer. Stepped-up power will be transported to the collector substation via five 34.5kV underground cable circuits. A total of 690V of electricity will be generated in the nacelle of each turbine and then transformed to 34.5kV by a generator step-up transformer located adjacent to each turbine. The 34.5kV energy will be transported to the project’s substation via underground and overhead collector circuits. Major works include the construction of access roads, installation of wind turbines, operations and maintenance facility, solar modules, a 20km-long transmission line, interconnection station, and a 2km section that runs under the hamlet of Nelles Corners. The projects share amenities such as the collector sub-station, operations and maintenance building, temporary storage and staging areas, as well as overhead / underground collector lines. "The wind project consists of 67 Siemens SWT-2.3 wind turbines." Canadian Solar Solutions, a subsidiary of Canadian Solar, is the engineering, procurement, and construction contractor. In November 2013, Canadian Solar placed an $80m contract with ABB and Bondfield Construction for the supply or for the solar projectf 100MW turnkey PV solar project. Siemens supplied the wind turbines with Surespan contracted for the erection process.